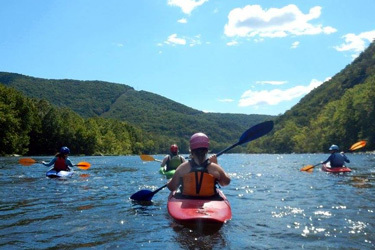 Off-campus paddling options include kayaking, canoeing and whitewater rafting. Sweet Briar’s “after-class” river run is the Balcony Falls section of the James River. With several class II and class III rapids, this is the perfect section of river for beginners and more advanced paddlers alike. Sweet Briar is also close to the Maury, Tye, Piney and Roanoke rivers. And, we’re only three hours from the New River and Gauley River in West Virginia, both world-class paddling for more advanced boaters. To learn more, check water levels, or find a section of river to paddle check out American Whitewater.